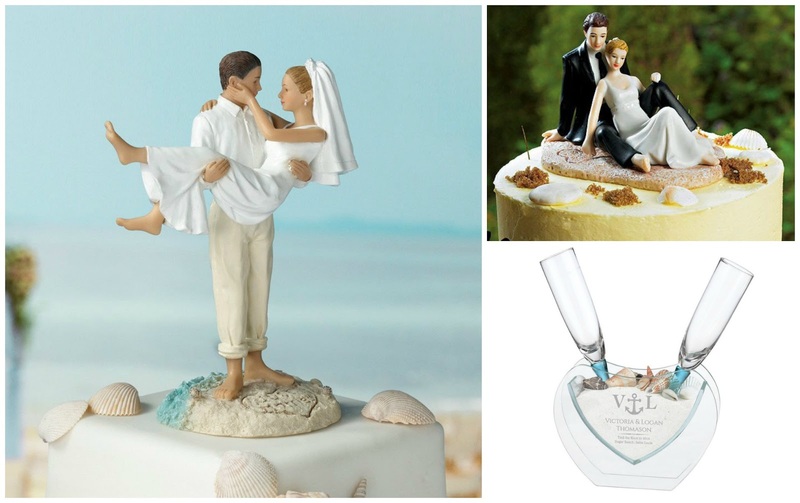 Once the weather stays warm, that's the perfect time for planning a wedding by the water! The natural beauty surrounding bodies of water, whether pond, river, lake, or ocean, adds a wonderful feeling to the look of your wedding. 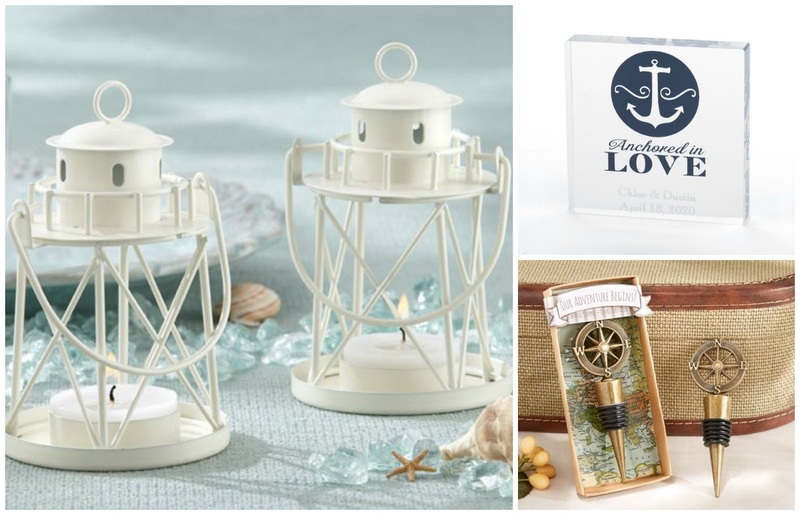 We've come up with a few fun ideas for any bride and groom planning a nautical wedding by a lake or a sandy beach celebration, along with some adorable wedding decor you can find at WhereBridesGo.com. Beach weddings aren't complete without a few lovely seashells scattered around. There are numerous ways to incorporate these natural decorations. As guests enter, you can ask them to each sign a shell for your alternative guest book, and these can be displayed in a beautiful vase or jar in your new home together. Flowers can wilt quickly if your outdoor wedding on the beach takes place on an extremely hot day. 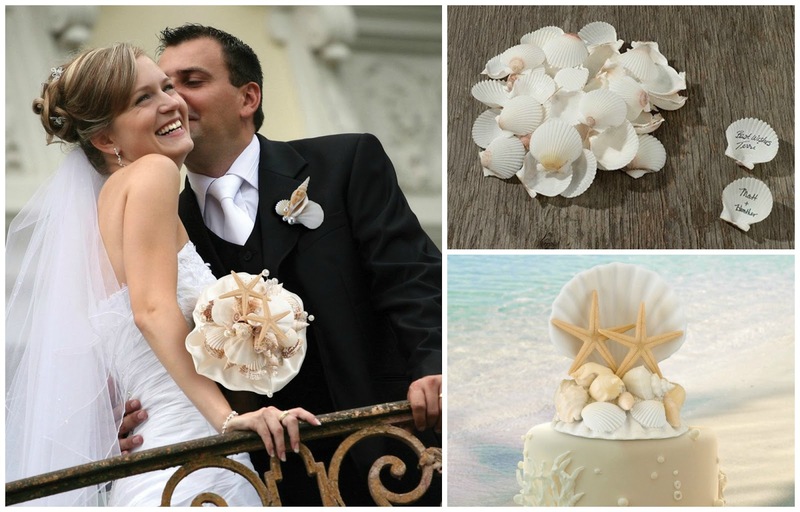 Carrying a seashell bouquet solves that problem and ties in with the theme wonderfully. 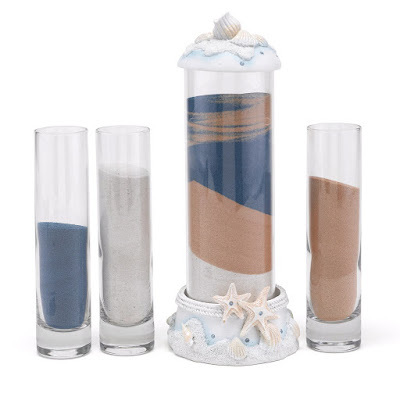 There are lots of different types of unity ceremonies, but a sand ceremony in the sand sounds like the perfect choice for a beach wedding. When it comes to reception decor, you can pull more oceanic items into it in addition to seashells. 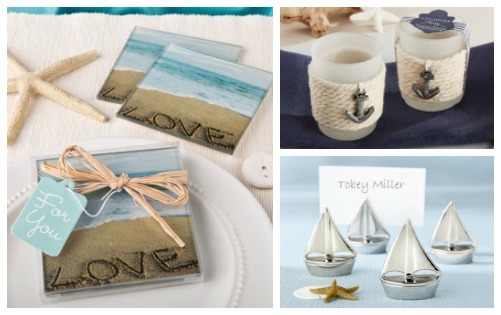 Starfish add a glamorous touch, and sand dollars look great next to those. You may even want to incorporate some sort of fish or mermaid in there somewhere too. Candles on the tables will sparkle brilliantly as the sun sets over the water, and a few floating candles even allow you to bring the water element to the tables. 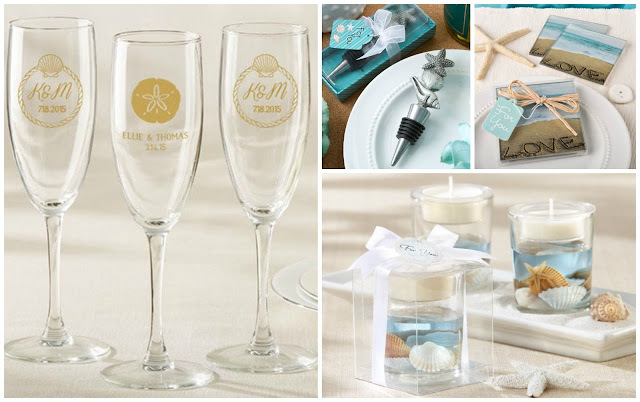 While the color scheme for a beach wedding generally leans toward browns and tans like the sand and pastels that you might see in a gorgeous sunset, weddings near a lake seem to often go with a more bold color pattern. 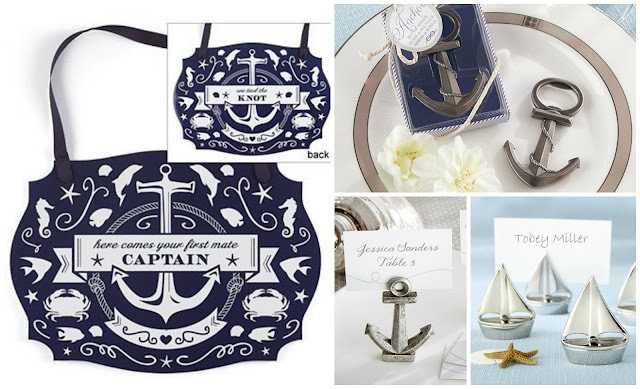 Nautical themed weddings usually use a lot of navy blues, yellows, reds, bright whites, and many times a thick, striped pattern often associated with this type of theme. The word "nautical" relates to sailors, ships, and navigation. Key elements that you can incorporate are anchors, life preservers, sailboats, and ropes like the type used to tie a boat to the dock. "Tying the knot" is a much-used term for marriage, and there is actually a unity ceremony in which the bride and groom tie two pieces of rope together into a fisherman's knot, which is the strongest knot there is. The bond will not break, and the more pressure applied to it, the stronger it gets. 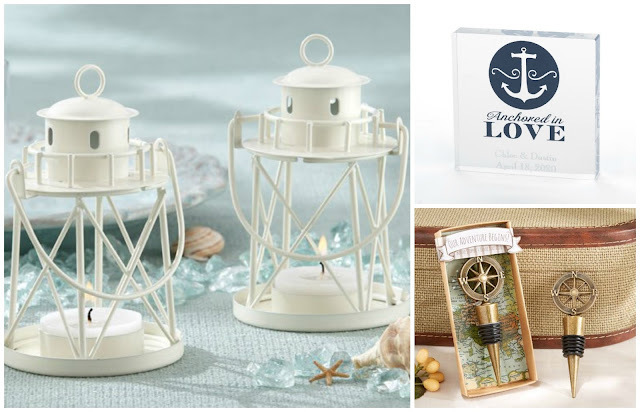 Lighthouses can be great items to pull into the decorations in some way. Lanterns on every table are the perfect element to give the entire reception area a warm, romantic glow. 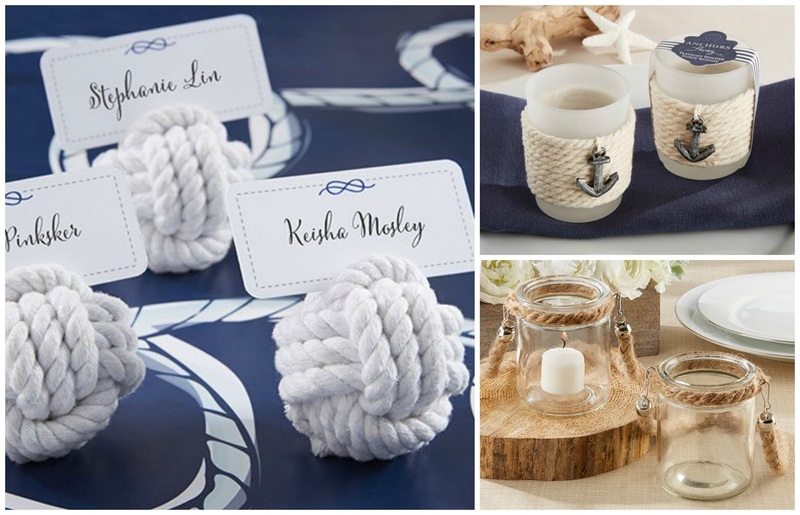 A fun guest book alternative for a nautical wedding would be to have everyone sign a life preserver to be hung at your lake house, or maybe a big paddle that could also be displayed on the wall of your new home. You could even have your guests write sweet notes and place them in a huge jar for a "message in a bottle" idea. There are lots of other incredible things that you can do to tie a waterfront theme into your wedding decor, but the few we have included above should get your creative juices flowing. You can find everything pictured above, along with many more wonderful items, in our online wedding accessory store. No matter what your theme is or when you are getting married, WhereBridesGo.com is where brides go... for what brides love!